Elaine by Atkinson Grimshaw. 1877. 32 by 47 1/4 inches. Signed, inscribed "Painted by Atkinson Grimshaw at ye Castle by the Sea, Scarborough," and dated 1877 on the stretcher. Atkinson Grimshaw greatly loved the poetry of Lord Tennyson, and was much inspired by it. In the 1870's, besides this highly romantic picture of "Elaine", he painted at least two versions of the Lady of Shalott. 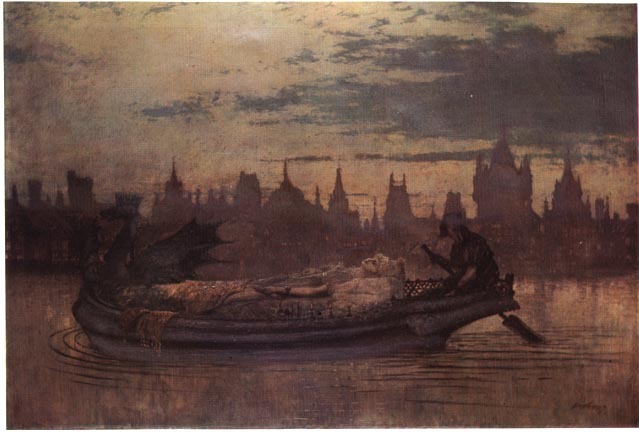 The stories are analogues, and both describe the the death of fair maidens, who died for love of Sir Lancelot, and whose bodies float down the river to the place of Camelot. Grimshaw's direct source for this painting is Tennyson's "Elaine and Lancelot" (first published in 1859), from which he quotes. Elaine was known as "the lily maid of Astolat"; the barque is her bier, and is steered by a faithful servitor of her household, who was deaf and dumb. In her hand she bears a letter telling Lancelot of her love for him, and begging him to pray for her soul. Highly Important Victorian Paintings and Drawings. Catalogue for sale of 24 October 1978. London: Sotheby's Belgravia, 1978. Catalogue number 15.